The watercolor palate of native wildflower colors, the purple, the orange, the yellow, the blue, was stunning this year. Photo courtesy of the California Chaparral Institute. President Donald Trump on Wednesday ordered a review of two dozen national monuments that could end protections against mining, logging and oil drilling. Trumps executive order could put the Carrizo Plain National Monument in San Luis Obispo County up for reconsideration. Under the 1906 Antiquities Act, either Congress or the president can protect federal lands by designating them as a national monument. 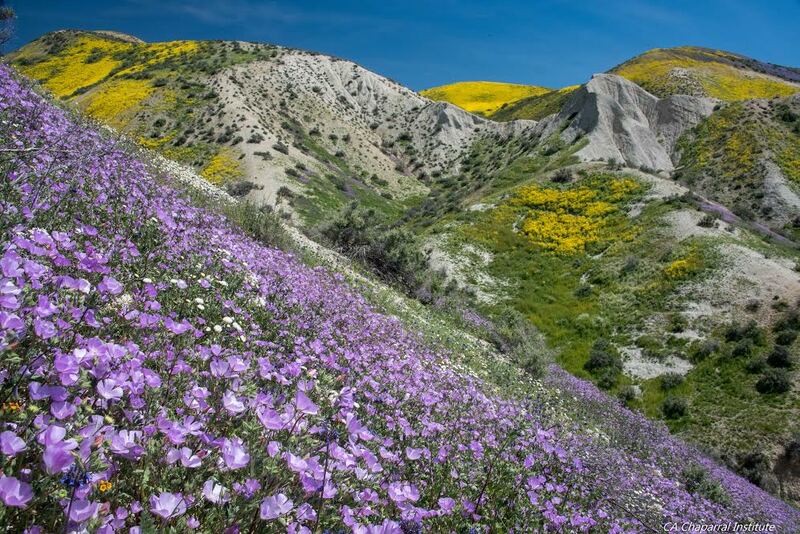 In 2001, President Bill Clinton declared the Carrizo Plain a national monument. “The Antiquities Act does not give the federal government unlimited power to lock up millions of acres of land and water, and it’s time that we ended this abusive practice,” Trump declared. Trump’s order instructs Interior Secretary Ryan Zinke to review all national monuments that make up 100,000 acres or more, and were created by presidential proclamation since 1996. The Carrizo Plain spans 204,107 acres. The Carrizo Plain’s version of Half Dome with Parry’s mallow (Eremalche parryi) in the foreground. Photo courtesy of the California Chaparral Institute. Environmental groups have announced plans to battle to protect the Carrizo Plain National Monument. 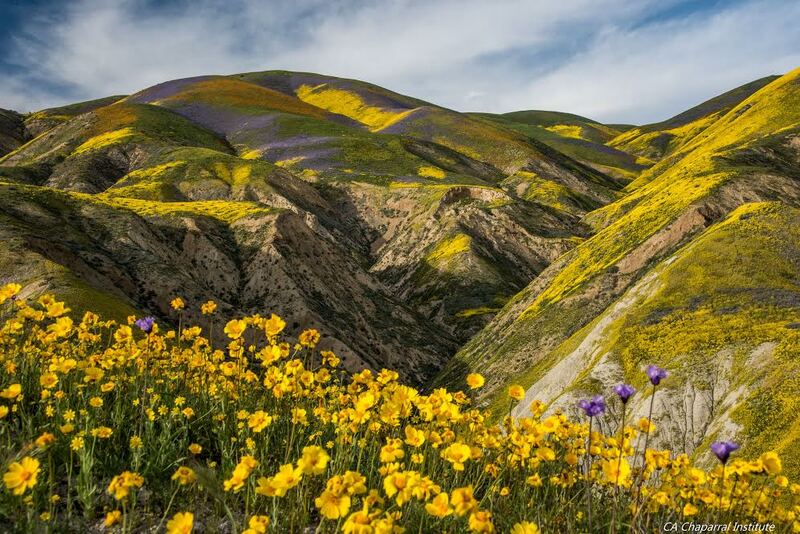 The Carrizo Plain National Monument is a vast expanse of golden grasslands and stark ridges which recently attracted thousands of visitors to a “super bloom” of wildflowers. Often referred to as “California’s Serengeti,” the Carrizo Plain is one of the last undeveloped remnants of the southern San Joaquin Valley ecosystem. Everywhere, awash in color! The pink swash on the right is filled with the drying seed cases of shiny pepper grass (Lepidium nitidum). Photo courtesy of the California Chaparral Institute. 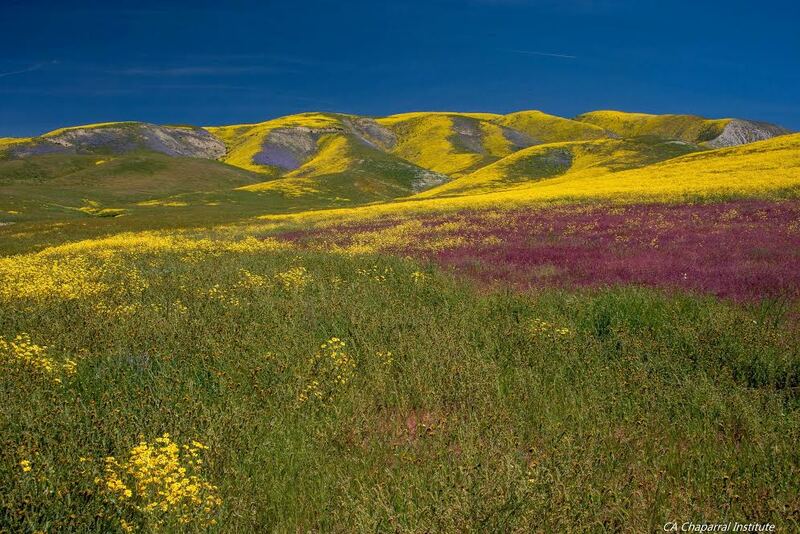 · Carrizo Plain National Monument in California, proclaimed by Clinton in 2001 (204,107 acres). · Giant Sequoia National Monument in California, proclaimed by Clinton in 2000 (327,769 acres). · Sand to Snow National Monument in California, proclaimed by Obama in 2016 (154,000 acres). · Berryessa Snow Mountain in California, proclaimed by Obama in 2015 (330,780 acres). · Mojave Trails National Monument in California, proclaimed by Obama in 2016 (1.6 million acres). · World War II Valor in the Pacific National Monument in California, Hawaii and Alaska, proclaimed by Bush in 2008 (4 million acres). · Grand Staircase-Escalante National Monument in Utah, proclaimed by President Clinton in 1996. (1.7 million acres). · Grand Canyon-Parashant National Monument in Arizona, proclaimed by Clinton in 2000 (1 million acres). · Vermilion Cliffs National Monument in Arizona, proclaimed by Clinton in 2000 (279,568 acres). · Hanford Reach National Monument in Washington, proclaimed by Clinton in 2000 (194,450 acres). · Canyons of the Ancients National Monument in Colorado, proclaimed by Clinton in 2000 (175,160 acres). · Ironwood Forest National Monument in Arizona, proclaimed by Clinton in 2000 (128,917 acres). · Sonoran Desert National Monument in Arizona, proclaimed by Clinton in 2001 (486,149 acres). · Upper Missouri River Breaks National Monument in Montana, proclaimed by Clinton in 2001 (377,346 acres). · Papahanaumokuakea Marine National Monument in the Pacific Ocean, proclaimed by President George W. Bush in 2006 and expanded by President Barack Obama in 2016, (89.6 million acres). · Marianas Trench Marine National Monument in the Pacific Ocean, proclaimed by Bush in 2009 (60.9 million acres). · Pacific Remote Islands Marine National Monument in the Pacific Ocean, proclaimed by Bush in 2009 and enlarged by Obama in 2014. (55.6 million acres). · Rose Atoll Marine National Monument in American Samoa, proclaimed by Bush in 2009 (8.6 million acres). · Rio Grande del Norte National Monument in New Mexico, proclaimed by Obama in 2013. (242,555 acres). · Organ Mountains-Desert Peaks National Monument in New Mexico, proclaimed by Obama in 2014 (496,330 acres). · Basin and Range National Monument in Nevada, proclaimed by Obama in 2015 (703,585 acres). · Northeast Canyons & Seamounts Marine National Monument in the Atlantic Ocean, proclaimed by Obama in 2016 (3.1 million acres). · Bears Ears National Monument in Utah, proclaimed by Obama in 2016 (1.4 million acres). · Gold Butte National Monument in Nevada, proclaimed by Obama in 2016 (296,937 acres). Ok, let’s be honest here. What we have is a bunch of lazy, fat, old white guy gun-nuts angry about their lot in life and thus who want to do something to get even with all those trim people they see maddeningly zipping by on their bikes or hiking up the mountains while they sit on their couches feeling like spuds. Suddenly they’ve finally got a kindred-soul in the White House and they are delirious with delight. Who cares that he’s an amoral, anti-intellectual turd, all those Christian ethics they disingenuously shouted in the past are now no-where to be seen. “Environmental wackos” they call conservationists, echoing their idol Rush (Russian?) Limbaugh. These losers want to do damage. Level the playing field. They have nothing positive to contribute to the betterment of the world, they are all about hate, spite and destroying. Make others as angry and miserable as themselves. Undo all the good that millions of other people have worked so hard for. Go after what people care about. There were two separate acts (sets of law) and the divisionary line was the 100th meridian. West of 100th (in October 21st, 1976) FLIPMA took effect and Congress disavowed to dispose of public lands. As such there are still two sets of laws in this country. Congress completely interpreted the law to fit their agenda. Every State enabling compact was carried over and remains there west of the 100th. The States were to retain sovereignty, unless expressly delegated to the Federal Government via the Constitution. The obligation to dispose of public land was a matter of constitutional mandate and contract law and yet the Congress has refused to recognize this. This is why 1976 was a great year of attack against this nation and the 100th meridian is a great reminder of that (because if FLIPMA and the attack on property rights that occured West of the 100th Meridian). Public lands are considered federal lands and federal enclaves; therefore lands deemed “public” within the states are considered foreign to the States. They fall under special Maritime and Territorial law because of this. 1976 FLPMA Act was a strike against our republic – mainly occuring west of 100th but affecting everyone… there were two sets of regulations for the US and breaking point is the 100th meridian. West of the 100th via the Federal Land Policy and Management Act, congress oficially disavowed any obligation to its constitutional obligations (to release the public lands).